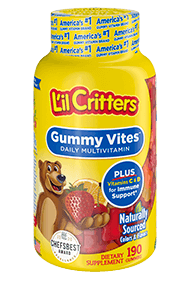 From the maker of L'il Critters, the #1 Kids Gummy Vitamin brand, comes a complete multivitamin in fun Despicable Me Minion Made™ shapes. No high fructose corn syrup, no synthetic (FD&C) dyes and no gluten. Great tasting, natural flavors: Strawberry-banana and orange. Despicable Me, Minion Made and all related marks and characters are trademarks and copyrights of Universal Studios. Licensed by Universal Studios LLC. All Rights Reserved.